You’ve probably heard about IoT, or the “Internet of Things”, and perhaps used it in your life. Whether you control your thermostat from your smartphone or watch your health with a Fitbit, IoT is nearly everywhere in our modern world. However, one area that many people forget about is how IoT is changing the infrastructure of the very cities we live and work in. Smart cities are aimed at making life more efficient and safer, reducing the “pain points” that many of us, up until now, have been forced to grin and bear—like a timed-traffic light at night when there isn’t any traffic. With some of our modern concerns being the need for updating our cities’ infrastructure, smart cities can be the answer to many problems that may have been deemed too costly to fix. 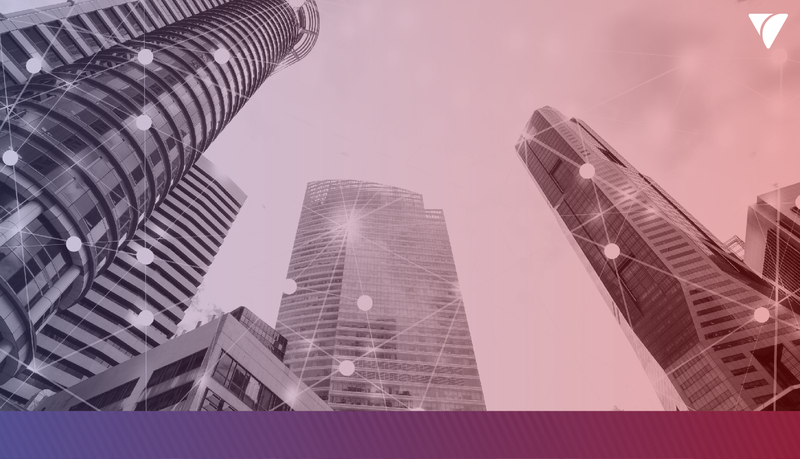 In this article, we’ll take a look at a number of ways that smart cities are providing a higher quality of life and efficiency, which cities are currently “smart”, and what the future of IoT and smart cities will be. As one of the areas sorely needing improved efficiency is elevators, particularly in usage and maintenance. According to IBM’s research in 2010, NYC residents waited over 22.5 years for elevators, making this a time sink in need of a drastic shift. IoT’s application can be used to analyze elevator usage data and change patterns of downtime to predict max usage, when parts are in need of fixing, and energy savings. Having lighting work in smart cities can revolutionize how cities are lit up in public spaces and at homes. Most popular are SLS, or Smart Lighting Systems, which are designed to create an autonomous and more efficient lighting management system. These systems can minimize light usage for underused areas or boost lighting for underserved areas, as well as react to their environment’s occupants and provide security applications, like motion-detection and remote monitoring. For instance, runners looking for a nighttime jog can be accompanied with a lighted way to prevent crime or ward off nocturnal animals from public spaces. As the need for a focus on sustainable sources of energy begins to intensify, smart cities can use IoT to help maximize resource conservation. With architects and builders implementing smart technologies, this may become the standard in the future. For instance, in Amsterdam—perhaps the world’s smartest city—energy companies have been experimenting with solar panels and energy storage units that can help offset problems by peak energy usage. During times of lower stress on the grid, homes equipped with IoT-enabled smart meters can not only charge batteries to offset the strain on off-peak times, but residents will also get the opportunity to sell spare energy back to the smart grid. By the prediction of the European Commission, the year 2020 may see over 70% of consumers in the EU have smart meters for electricity installed, with 40% expected to have a smart gas meter. Building managers throughout the world are more frequently looking to incorporate IoT devices and solutions into their infrastructures in order to reduce costs and improve the quality of their buildings. By integrating IoT from the ground up, buildings can use the real-time data to control temperature, air flow, water and waste management, and other applications that can offset energy costs and provide optimal service when needed. Many cities around the world have already earned the distinction of being recognized as a “smart city”. In the United States, tech-heavy cities like Seattle, Boston, and San Francisco top the list for their integration of IoT technology. Other cities, like NYC and Camden, NJ, have begun testing gunshot detection devices in the Bronx and Brooklyn to offset crime and catch perpetrators to mitigate gun violence. On the West Coast, San Diego has begun to implement cameras built into connected streetlights, with the aim both monitor pedestrian activity and reroute vehicles during peak hours to avoid alleviate congestion and prevent pedestrian accidents. European cities like London, however, has been using smart-city concepts for almost a decade. Autolib is an electric car-sharing service that debuted in 2011. 7 years later, its fleet has grown to 3,000 cars — and plays a role in reducing emissions across the iconic city. London, with its chronic parking problem, has launched a smart parking program driven by IoT that helps drivers quickly find parking spaces and reduce lengthy searches for available spots, in turn alleviating needless congestion. And for bicycle transport, bike-friendly Copenhagen has begun using sensors to monitor the bike traffic in real time, improving bike routes in the city. Because of the wide range of applications that IoT can have on every facet of a smart city—with some technology that hasn’t even been invented yet—it can be hard to predict just what the cities of the future will be. There is enormous potential for smart cities to profoundly change how we will live in the near future. With the development of 5G on the horizon, this could mean new potentialities that haven’t been realized with current technology. For instance, with only 4G available, autonomous vehicles would take four times as long to reach a destination as compared to a vehicle running on 5G. With this jump in speed, autonomous vehicles may finally become an option for smart cities, clearing up congestion, eliminating delays and accidents normally attributed to human error. Similarly, IoT’s applications with augmented reality (AR) can finally begin seeing some extensive usage in smart cities, beyond novel applications like Pokemon Go and other apps. Instead, AR can be used in cities for more in-depth navigation, search engines for objects, social networks, eliminating language-barriers, add to the tourist/visitor experience, and ultimately increased safety.